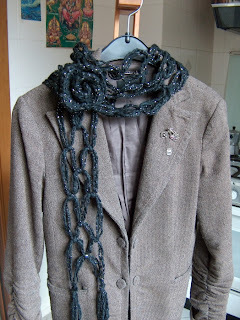 The pattern is the No-Knit Scarf from Martha Stewart, and it was so easy to make..with a great result i think! I put on my Black and Silver flower brooch, which is made with the same yarn, and i think it gives a more stylish touch. I recommend this pattern, quick and beautiful! 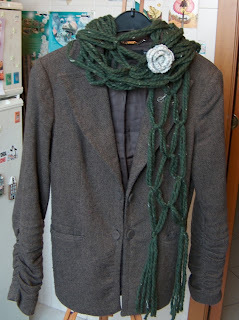 Here's another one in a chunky green yarn and white flower brooch pin.